Lyotard pedals were made from the 1920s until the late 1980s and were good quality and innovative in their designs. All pedals are English threaded unless stated otherwise in the description. French threaded pedals will not thread safely into English threaded cranks. 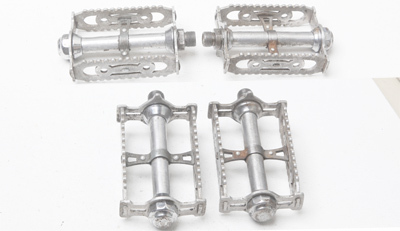 French made pedals can be made with either French or English threads – Campagnolo and Zeus pedals were additionally available with French pedal threads.